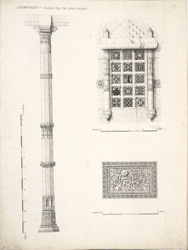 Illustration of details from the Jami Masjid at Champaner from James Burgess' 'Original Drawings [of] Muhammadan Architecture in Gujarat.' The Jami Masjid, built in 1523, is of considerable architectural importance. The plan is similar to the Jami Masjid in Ahmadabad, built 75 years earlier. It is rectangular mosque with an open courtyard. The main entrance to the courtyard is on the east side in the form of a large domed portico raised on a podium with steps on the north and south sides. The entrance to the mosque is flanked by two octagonal minarets. The exterior is notable for its carvings and oriel windows, a typical Gujarati vernacular device. The prayer hall of the mosque is covered in eleven domes with the central part of the roof raised on a further two stories of pillars arcades.